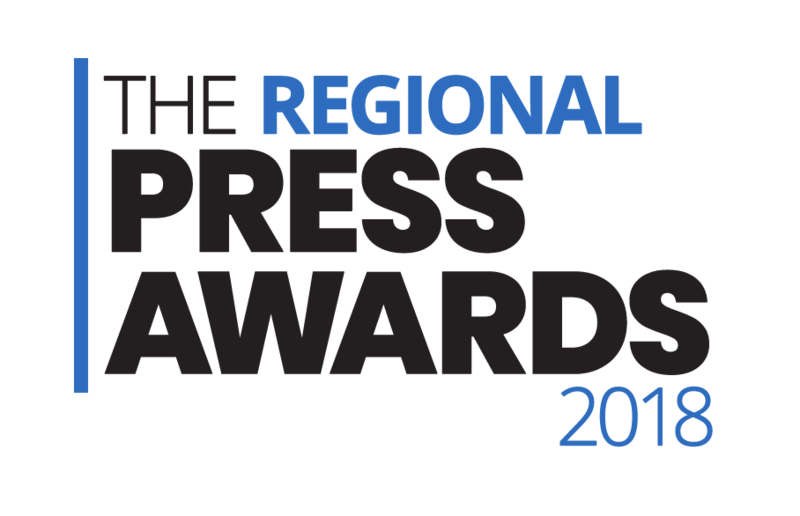 A country-wide news website is leading the race for this year’s Regional Press Awards with 14 nominations in the shortlist unveiled yesterday. WalesOnline is up for awards in no fewer than 12 categories at next month’s event, with two nominations apiece in the Young Journalist of the Year and Digital Initiative of the Year sections. One of its journalists, social affairs correspondent Will Hayward, is nominated in no fewer than five categories – Feature Writer, Columnist, Social Media Journalist, Data Journalist and the Reporting Communities Awards. The prizes will be handed out at a lunchtime ceremony to be held at the IET, Savoy Place in London on Friday 17 May. Today’s shortlist sees a strong showing for Reach plc titles with the Manchester Evening News securing 12 nominations, the Liverpool Echo 10 and the Reach Data Unit seven in addition to the 14 secured by Wales Online. There are 10 nominations for the Irish News, nine for the Yorkshire Post, and five for the Sunday Post. The awards are organised by the Society of Editors on behalf of the industry with the support of headline sponsors Facebook and United Utilities. Other sponsors and supporters include Google, Foot Anstey, the News Media Association, the Press Association, Asda and HoldtheFrontPage which is sponsoring the Young Journalist of the Year award for the ninth successive year. This year’s awards see a new emphasis on rewarding smaller newspapers and digital journalism with the number of categories increasing from 28 to 38. New categories up for grabs this year include Digital Live News Reporter of the Year and Data Journalist of the Year, Magazine of the Year, Magazine Designer of the Year and Free Weekly Newspaper of the Year’. Another new category is the Cathryn Nicoll Interviewer of the Year Award, set up by the News Media Association in memory of Cathryn Nicoll who held the position of news editor at the Croydon Advertiser during her career as a journalist. The awards ceremony will once again be hosted by LBC radio presenter Nick Ferrari. For individual tickets or tables for the event please contact Angela Upton at office@societyofeditors.org or on 01223 304080. The full shortlist is as follows. Congratulations to Trevor Heaton for his nomination in the Feature Writer category. It’s a big shame he’s no longer a part of the slimmed-down Archant features team. Nothing again for hyperlocals in the publications categories … let there be no doubt about the snootiness of the ‘mainstream’. Don’t despair Once a sub…. we (Altrincham Today) are a hyperlocal and having ‘reversed’ into printing 18 months ago, we’re up for Magazine of the Year. Pleased as punch. Only Newsquest, Reach, Newsquest, Iliffe Media and JPI Media to beat! Wish us luck! With an ever-increasing number of categories and an ever-dwindling number of journalists, the time will soon arrive when everyone will win an award. Not sure what all the whinging is about. It seems only right to create these extra categories and I’ve always thought they should. The ‘regional press’ is such an enormous blob, which encompasses everything from enormously privileged newspapers that cover entire countries, to very large regional papers like the Yorkshire Post and the MEN, right down to scandalously poorly-resourced free local weekly papers and even hyper-locals, which are sometimes pretty much one man and his dog. When you’re in the room, as I have been a couple of times over the years, you become very aware that there is a massive inequality amongst the nominees. Some publications have booked out entire tables, at very high ticket prices, while others have had to lobby hard just to get their one or two nominees’ tickets and travel signed off. You have a handful of giants, whose ‘health correspondents’ and ‘science correspondents’ and ‘business correspondents’ and ‘deputy directors of social media management’ are all competing with their counterparts in various categories that most of the regional press could never even dream of entering. ‘A science correspondent?! Holy sh…’. Some publications in the room are producing entire newspapers with about five members of staff. So on the one hand, you’ve got people moaning in the comments here that there are too many categories now. But on the other hand, you’ve got people moaning that hyper-locals aren’t getting enough recognition. Well, how are hyper-locals, with their one or two editorial employees, supposed to compete with country-wide or city-wide behemoths with 100 or more employees? It is absolutely right that this distinction is made; that the privileged few giants, with their enormous staffs and seemingly endless lists of correspondents and columnists, compete amongst themselves so that the wider, far more poorly-resourced regional press is then able to compete on a far more level playing field. This is where the former HTFP/EDF awards are sorely missed. Those ensured a far more even competition. And they were free to enter. At some outlets, even paying for a reporter to enter their work into the RPAs is deemed a frivolous expense and vetoed. I agree that the HTFP/EDF awards are sorely missed, but they were only made possible by the very generous sponsorship of EDF, both in terms of money and staffing resources, and much as we would have liked to have carried them on, those sorts of sponsors do not grow on trees! Theres a real opportunity for a whole new group of awards solely for the new hyper local publishers across the uk.eg; those papers employing less than x number of staff or established less than x number of years. Having said that the rate at which the bigger groups are shedding staff they’d probably qualify too!